Michael Benge comes from an extremely diverse background of professional music making and music educational experiences and is a deeply entrenched in the Southern California Music scene. 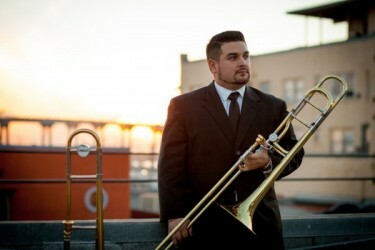 As lead trombonist and arranger for the B-Side Players, Michael performed extensively throughout the United States and Mexico and continues to work in collaboration with the 9 time San Diego music award winning band. Michael has performed, collaborated or recorded with major music staples ranging from the La Jolla Symphony Orchestra, various major musical pit orchestras, Quino of Big Mountain, Slightly Stupid, P.O.D, Johnny Clark, Norris Reid, Toots and the Maytals, Chunky Sanchez, Son Mayor, Javier Cabaneas, Gilbert Castellanos and Poncho Sanchez. He was also a featured performer for Yamaha Corporation of America at the NAMM (National Association of Music Merchants) convention in Anaheim California and is proud to have the honor of being a Yamaha performing artist. Michael has founded and directs multiple performance and music educational groups. Michael is the director of Trece De La Suerte, a bi-national 13-piece salsa band along with the San Diego Latin Jazz Collective and has performed in Latin America and the UK. Michael serves as musical director and arranger for La Cura Latin jazz project based in San Diego California. Michael also serves as an on going collaborator with the world renowned Dallas Brass, mainly in education outreach programing and artist relations. Michael studied trombone performance and music education at San Diego State University and is heavily involved in music education. Michael is currently Associate Director of Instrumental Music at Helix Charter High School. During his tenure at Helix Charter High School, the bands and orchestra have and continue to receive superior ratings at festivals, performing multiple corporate gigs for hire, and performing all across England and Scotland while the percussion program has flourished, bringing in multiple back to back championship titles. He has also served as chair of honor bands and orchestras for the Grossmont Union High School District’s board of band directors. Prior to Helix, Michael has worked with several great southern California programs like Mt. Carmel High School, Bernardo Heights Middle School, Westlake High School and Newbury Park High School. Michael is a member of the Southern California Band and Orchestra Association (SCSBOA), California Music Educators Association(CMEA), Jazz Educators Network (JEN), American Drumline Association (ADLA), Winter Guard International (WGI), and the Jazz at Linclon Center Essentially Ellington Program. In addition to public education, Michael has worked with several highly competitive youth arts organizations and currently the brass caption head at Vessel Drum and Bugel Corps. Michael also worked with Gold Drum and Corps, the Alternative Percussion Ensemble and San Diego Alliance Drum and Bugle Corps. Many of his students moving on to being DCI AND WGI finalists. Michael has setup and directed several honor groups, clinics, and master classes, and connected students with some of the countries top performers, conductors, and educators. Michael continues to grow. He is now highly sought out has as a guest artist, performer, clinician, conductor, and judge at the middle school and high school levels. In addition he is sought out as a guest lecturer the university level. Michael has an unrelenting passion for music education and providing amazing performance opportunities for students of music. Michael has collaborated with top artists like Grammy Hall of Famer Poncho Sanchez to give young and upcoming student musicians an opportunity to perform quality concerts and share the stage along side musical heros and giants.